Google’s algorithm offers searches after just a few keystrokes when typing in the search box, in an attempt to predict what the user wants to type. The combination of these suggestions can be funny, absurd, dadaistic – and sometimes even deeply moving. The rest of their explanation is worth reading, because it finds human pathos and beauty where Google finds functionality. 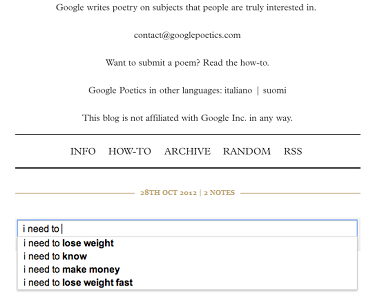 Their Google Poetics Tumblr blog compiles and shares examples of these found poems, broadcasting them via Twitter and Facebook, archiving them and expanding the scope of their project into other languages. Digital language artist and scholar John Cayley has compared the Google search bar to a mouth, hungrily accepting everything we feed it and not giving back. Nuotio and Omaheimo have discovered its voice (which is our voice, echoed through its algorithms) and taught us to listen to its poetry.